Diane Amberg is a Crop Service Technician at Corn Capital Innovations in Olivia, Minnesota. She will be assisting the Crop Insurance Specialist in handling applications forms, claims, and following up with customers. Diane is a strong believer of true customer service and very passionate about people. Building strong customer relationships and maintaining those relationships with honesty and integrity is the key to her customer service. Diane was raised on a farm near Belview, MN where her parents raised livestock and farmed soybeans, corn, and sugar beets. Diane is passionate about rural Minnesota and has lived in the area all but two years of her life. Her career in administration started with Minnesota Technology working with manufacturing companies in rural MN to help improve the economic impact in rural communities. Diane also served as administrative assistant for Minnesota Rural Partners which was located in the same office building as MN Technology. Due to state/federal budget cuts, the office in Redwood Falls, MN was closed and Diane went on to work for Altimate Medical, Inc. as their Quality Documentation Controls for a year. Seeking more interaction with people, Diane started a new venture when hired by Monsanto Production in Redwood Falls. She served as the shipping administrator for a number of years and by the time her stint was over there, she had done accounts payable, served as backup for payroll, assisted with harvest reporting, completed field inspections, and assisted with mapping. Diane has had numerous part time jobs at a variety of businesses and was also in direct sales for a couple of years. 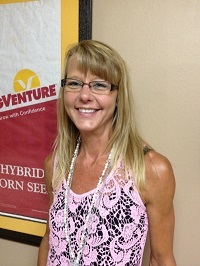 Diane joins Corn Capital Innovations with a knowledge in manufacturing, farming and business. She has two sons (of which she is very proud) that are employed in the ag industry and enjoys any opportunity to be able to spend time with them and other family. Diane enjoys being outside (except in the cold months) doing just about anything, likes to read a good book when time allows, enjoys walking, cooking, and of course, now working for Corn Capital. Join us as we welcome Diane into our growing company! « Fall harvest has begun!